You might have a major in mind, but that usually ends up changing by the time you’re a junior. I am really grateful that I took classes I was actually interested in, because it helped me decide what I really want to do and gave me insight into things I never would have known otherwise. 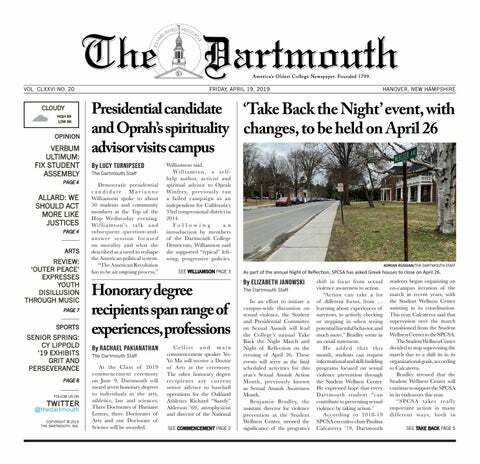 You also should not be worried if you don’t find your “community” right away — Dartmouth might seem like one big, happy family (which it certainly is! ), but it might not feel like one your freshman fall, when you’re still figuring out how to navigate college. It’s completely okay if you don’t have a clique of besties right after orientation week, because these things can take time. Dartmouth is a truly special place, and you have an exciting four years ahead of you! Like many of you, I was an over-achiever in high school, and my ambition carried over to my first-year fall. Ambition can most definitely be a positive, driving force in your life, and being successful in high school is one of the reasons why you are here now. But for me, my ambition and my success also made me afraid — namely, afraid to fail. I urge you from personal experience not to fall into that mindset. Do not be afraid to pursue the classes, clubs, sports, or anything else that interests you. You like singing? Great, audition for a capella! Volleyball sounds fun to you? Cool, try it out! I know this is easier said than done; the prospect of failing can be incredibly scary, and getting into certain clubs and sports can be immensely competitive, particularly at Dartmouth. And yes, it can be disheartening when you hear your first “no,” and especially when that “no” comes from the school and campus you worked so hard to get to. But all you can do is try. They say you miss 100% of the shots you don’t take, so take them. You’ll regret it if you don’t. It’s the first day of class, you’re in a big lecture hall and the professor asks a question. You are 60 percent sure you know the answer, but you’re afraid to raise your hand. You’re afraid of being wrong. One of three things will happen. Someone else will raise their hand, say what you were thinking and be correct. Instant bonus points. The second possibility is that they’re wrong, meaning that you also would have been wrong. But now the professor is addressing that person directly and they are learning and retaining more than you will because of that unique, face-to-face, personal connection. The final possibility is that the professor gives up and gives you all the answer. You write it down, and probably forget it until you open your notebook again the night before the midterm. The point is that fear halts progress. It halts learning, and it halts personal connections from happening. If you’re afraid of speaking in public, start by giving the answers you’re surest of first. Eventually, you’ll stop being afraid of being wrong. If you’re stressed out, or worried about a class, don’t be afraid to talk to your professor. Start by going to office hours with a specific problem set or list of questions. Eventually, you’ll feel comfortable enough to just drop in and have a meaningful conversation with them on any subject. The thing I regret most from freshman year is not doing that. The academic community here is incredible, and the professors most of the time can actually become your friends. And if not, they will at least give you the answers you need and the confidence to do better in that class and in classes to come. Finally, ask out that person you are crushing on. If you’re afraid to, don’t go for straight for dinner. Go for coffee, or breakfast at FoCo or lunch at the Hop. The worst they can say is “no,” and, if you’ve gotten to this point, you’ve probably already heard that word before; if you haven’t, it’s time you did. And if they say yes, you’ll be happy. TL;DR: Step 1: Define your fears. And don’t forget to have some fun while doing it! Honestly, fall term FLIES by. Before you know it, you’ll have a six week break over the interim. Personally, I didn’t account for how quickly not only the term but also the interim would go by. If you think you might want to do something over the interim, start planning now. If you’re feeling stressed out during fall term, don’t worry; it’ll be over soon. Either way, fall goes by fast, so take a moment out of your day to savor it.